Citrine is an incredible mineral variety of quartz with interesting properties and characteristics. Citrine is a quartz characterized by its yellow or, sometimes even orange, color. In this article, we will explore the characteristics and properties of citrine. Citrine is a variety of quartz that is characterized by its yellow coloring. Citrine can, in fact, look quite different when it comes to color. Some citrine crystals are a very pale yellow while others can be even golden. Yet, others can be as dark as brown, or look like honey. Sometimes, citrine contains sparkle inclusions or even rainbow elements. Citrine gets its name from the French word for lemon (citron) due to its yellow coloring. But even though the name of this crystal comes from French, it has been around for a lot longer than the French language. This crystal was used as a gem in ancient Greece, which means that it has been around for thousands of years at this point. You may have come across the terms Madeira (or Spanish) Topaz, Safranite, or Gold Topaz, but Citrine is something quite different from those other stones. The confusion comes from the fact that all of them have similar yellowish coloring. And, talking about the coloring, it is important to be aware that raw citrine is a lot lighter in color than the citrine that is available commercially. Why is that? Because most of the citrine crystals that is commercially available has been treated to look darker, often so it looks an orange-red or even a deep amber color. Citrine is produced in different countries. Brazil is its largest producer but this stone is also sourced in the neighboring South American country of Argentina; in the African nations of Zaire, Madagascar, and Namibia; or in the European nations of Russia and Spain. What Are the Properties of Citrine? The most noticeable property of citrine is its color. But not all specimens of this stone have the exact same color. Many specimens are yellow, but others are orange or, even, brown. Citrine belongs to the hexagonal crystal system. It has a refractive index between 1.54 and 1.55. And its SG is between 2.6 and 2.65. This stone is transparent and has a vitreous luster. Its double refraction is .009. Citrine, as we saw, belong to the quartz mineral class and have an indiscernible cleavage. Its hardness is 7. What Is Citrine Used For? Citrine is a particularly popular gemstone. It can be cut in many different ways, but the most popular cuts are rectangular and oval. Perhaps its most popular use is as a pendant stone. But citrine is also used is other pieces of jewelry, such as earrings, rings (where it is the centerpiece), necklaces, and bracelets. Even citrine of a lesser quality can be used it is combined with white quartz. That kind of lesser-quality citrine is usually found for bracelets and necklaces, usually as beads. There are different kinds of citrine, including lemon quartz (light to dark yellow); golden citrine (golden yellow); palmeria citrine (bright orange); Madeira citrine (from brownish red to orange-red); and yellow citrine (lemon-like yellow color). Some people find Citrine hard to distinguish from the orange and yellow varieties of Topaz, the yellow variety of Sapphire, or even Heliodor (Golden Beryl). Orange citrine can be hard to distinguish from some grossular garnets. Most citrine stones get their color from heat treatments. 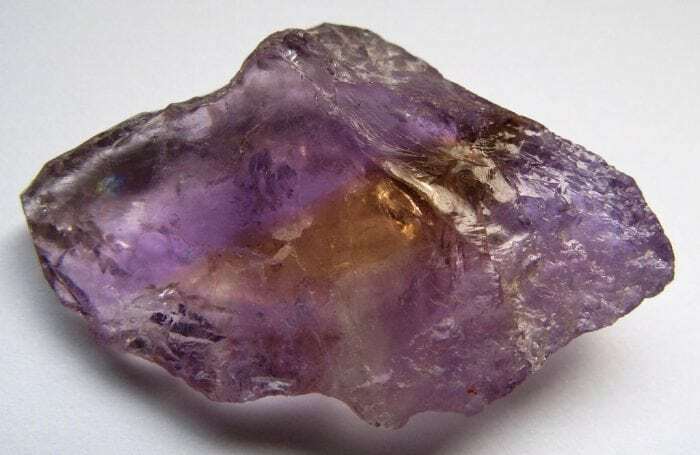 Amethyst is heated at approximately 750 degrees Fahrenheit until it gets to look mild yellow. When heated at approximately 1700 degrees Fahrenheit, Amethyst gets to look anything from deep orange to reddish. By far, the most popular result is the reddish colors. Also, some intense yellow shades can be obtained by the irradiation of the quartz, which will produce what is often referred to a lemon quartz. Other vivid colors can be obtained by using the so-called hydrothermal method, which results in what is known as the synthetic citrine.